Steampunk is a sub-genre of science fiction that portrays an anachronistic world where steam is king. The steam power of the Victorian age serves the dominant source of energy, leading to the creation of strange technologies and mechanical objects. As can be expected, this alternate history reshapes the world as we know it, affecting even fashion. 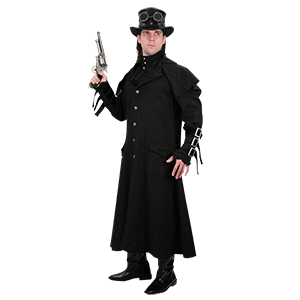 We offer a wide array of steampunk clothing for any who seek to travel to this exciting world. Including period attire for men and women, much of our steampunk apparel displays a decidedly Victorian bent, while other pieces lean more towards a modern or science fiction style with apocalyptic elements. Our Neo-Victorian clothing ranges from grandiose fashion to piece for everyday outfits, ensuring that you can create many stunning looks. If you are looking to join the steampunk revolution, be sure to check out the steampunk attire you will find here. When you want a stylish steampunk outfit without all the trouble of assembling the different pieces, you can find the perfect solution here. We supply a variety of complete womens steampunk ensembles to give you a great Neo-Victorian look. Our assembled steampunk ensembles range from period Victorian looks to modern dieselpunk ensembles, and everything in between! Most of our womens steampunk outfits contain between two and four clothing items that can be easily accessorized with our steampunk fascinators, lace gloves, gear arm bands, and steampunk goggles to make them uniquely yours. These steampunk outfits are composed of actual clothing items made from top quality materials, allowing you to save money by purchasing them all together rather than paying individual prices. Take a moment to look through our steampunk clothing sets to see the many incredible steampunk looks you can achieve! Embrace the charm of the Victorian era with this fine selection of mens steampunk jackets and coats. We offer many steampunk gentlemens coats and Victorian frock coats to add style and warmth to your Neo-Victorian ensemble. With an opera coat, steampunk tailcoat, or Victorian Inverness coat, you will cut a striking figure, ready for a gala or steampunk convention. Made from a variety of fine materials that come in a handful of colors, you can be sure to discover a piece of steampunk outerwear to suit your needs. Our steampunk jackets are available in several sizes to ensure a comfortable fit. This assortment of mens alternative history coats makes a great functional addition to your steampunk cosplay. Check out the amazing style of these mens steampunk shirts and Victorian dress shirts! We offer a selection of mens period shirts and modern steampunk t-shirts to suit the look of any guy. Our long sleeve Neo-Victorian shirts work great to complete an alternative history ensemble, while our sleeveless steampunk shirts pair well with jeans or a pair of our mens steampunk pants. Dress like a steampunk nobleman, airship captain, or steampunk engineer with our various styles. Several of our steampunk t-shirts feature designs with a gothic twist that work great for post-apocalyptic fashion and industrial styles. 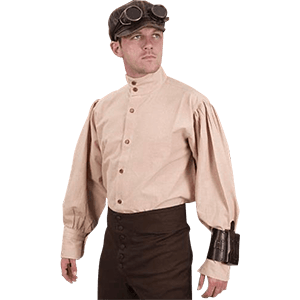 No matter what your preferred look is, you can create a fantastic mens steampunk cosplay outfit with these shirts! 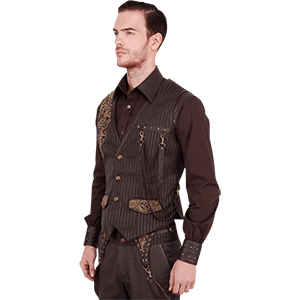 Nothing adds more charm to your Neo-Victorian ensemble than one of our mens steampunk vests or steampunk waistcoats. A Victorian gentlemens vest, like one of our elegant brocade vests, suits a steampunk duke or nobleman ensemble perfectly. We also offer mens shaper vests that help to create the ideal shoulder-to-hip ratio with their structured fit. Our collection of striped steampunk waistcoats, leather vests, and striking engineer vests offer practical style to mens alternative history looks. Made from a variety of fine materials, these formal vests go well with accessories like pocket watches and steampunk cravats. 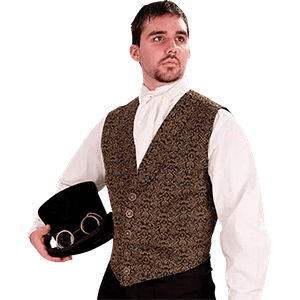 We provide our Victorian waistcoats and steampunk vests in a range of sizes to allow you to find one that fits well. Peruse our selection of high quality mens vests to find the perfect one for your steampunk cosplay. Some of the most important Neo-Victorian accessories, steampunk cravats and period neckwear offer elegant detail to your steampunk formal attire. We carry an assortment of fine Victorian cravats, lace jabots, aviator scarves, and ruffled collars to spruce up any steampunk ensemble. Suitable for men and women, our selection of neckwear accessories goes great with our period vests and steampunk corsets to create an unforgettable alternative history ensemble. Decorated with steampunk patterns, metal gears, and other Neo-Victorian ornamentation, these fine pieces elevate your steampunk clothing to an art form. Whether you dress as an airship captain, Victorian lady, or steampunk nobleman, you will find a piece of steampunk neckwear here to suit your cosplay. Make your steampunk cosplay truly your own with our selection of fantastic womens steampunk accessories. We carry a wide assortment of steampunk fashion items to accent your steampunk attire, whether you prefer to dress as an elegant Victorian lady or daring airship mistress. Browse through this category to see our many lace opera gloves, steampunk belts, leather arm bands, feathered steampunk fascinator hats, steampunk choker collars, and more. These steampunk accessories turn average Neo-Victorian apparel into fantastic steampunk couture. 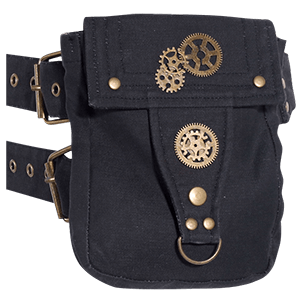 Decorated with lace, metal gears, metal cylinders, buckles, clock hands, steampunk keys, and other ornamentation, these alternative fashion accessories will earn you admiring glances from onlookers at your next steampunk convention. Check back regularly to see the latest additions! With the help of these steampunk dresses, you can create the perfect steampunk ensemble for a themed party or convention. The Neo-Victorian gowns that we offer here come in a variety of styles ranging from post-apocalyptic dresses to Victorian lady dresses to modernized steampunk sundresses. Many of our full-length gowns display tiered ruffles, period bustles, and puffy sleeves. Our steampunk corset dresses and sleeveless steampunk dresses provide a flirty look that can be dressed up with fun accessories like opera gloves and steampunk arm warmers. Offered in lots of colors, patterns, and fine materials, these Neo-Victorian dresses suit just about any look. Take a moment to browse our selection for your next fine piece of womens steampunk apparel. For the perfect middle ground between a period bodice and an underbust corset, we offer a selection of womens steampunk harnesses and vests. Made from leather, faux leather, brocade, and other fine materials, our ladies vests and underbust harnesses fit snugly around your torso with traditional vest, cincher, halter top, and crop top designs to provide plenty of variety. Our Neo-Victorian harnesses make especially great pieces to support holsters, pouches, and other useful accessories. Not only this, but both our steampunk vests and harnesses go great over billowy tops and period blouses to accentuate your figure. These leather harnesses and brocade vests fasten with buckles, clasps, buttons, drawstrings, or zippers, some offering minor size adjustments. Browse our selection of fine ladies steampunk harnesses and period vests to find the perfect one for your ensemble. Our collection of womens steampunk legwear offers you a unique opportunity to experience the charm of steampunk couture. 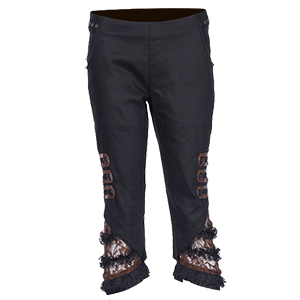 Drawing upon the science fiction and alternative history aspects of steampunk fashion, the steampunk pants here display excellent style that makes them equally ideal for Victorian period ensembles and post-apocalyptic outfits. 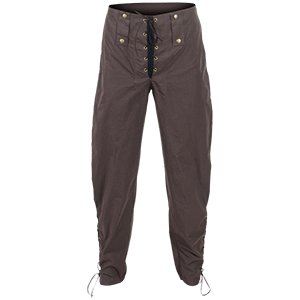 Our assortment of womens breeches and steampunk crop pants feature details of lace, buckles, and faux leather, while many of our womens steampunk trousers display cutouts and buttons that set them apart. We also carry an array of womens steampunk leggings and Neo-Victorian tights that look fabulous with our steampunk skirts and period dresses. Finally, our steampunk shorts make the perfect choice for steampunk summer attire. Check back regularly to see our latest additions of womens legwear! Womens steampunk shirts look great with casual clothing or formal attire, offering you flexible and distinctive style. We carry a great mix of womens steampunk t-shirts, steampunk tank tops, Neo-Victorian blouses, steampunk crop tops, and womens alternative history shirts of various designs. Our range of womens shirts contains short sleeve tops, long sleeve blouses, and sleeveless tops to give you options for any time of year. Many of our period blouses feature ruffles, jabots, lace, and other authentic Victorian details. Our modernized steampunk tops make use of cutouts, buckled straps, metal gears, studs, and other design elements. Our steampunk shirts display an incredible range of styles, drawing from the dieselpunk and cyberpunk alternative fashions, as well. Several of our womens t-shirts show off steampunk prints featuring mechanical grim reapers, fairies, dragons, and other dark fantasy designs. 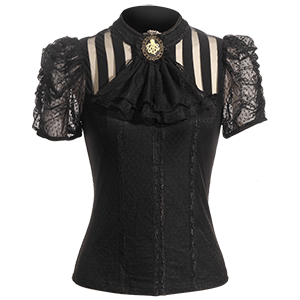 Look through our array of womens steampunk tops to find the perfect piece to go with anything from Neo-Victorian ensembles to post-apocalyptic attire. Our selection embraces the whole range of steampunk fashion. Combining elements of period Victorian fashion with the eclectic appearance of alternative history styles, our womens steampunk skirts cover a broad range of looks for you to enjoy. 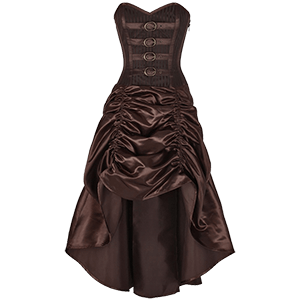 We are happy to present our selection of womens steampunk skirts and period bustles for your wardrobe. We carry full-length Neo-Victorian skirts, fitted fishtail skirts, steampunk A-line skirts, gathered skirts of various lengths, tiered ruffle skirts, and steampunk mini skirts. Our steampunk overskirts and steampunk bustles look great over these womens skirts as well as the many steampunk dresses we offer. Our steampunk skirts come in a variety of patterns, including solid colors, stripes, and intricate prints. Many of our skirts display decorations like ruffles, lace, embroidery, buttons, chains, buckled straps, and more. Whether you want a piece to suit your formal Victorian blouse or a bold post-apocalyptic top, we have a unique skirt style to fit your needs. Our selection of striking steampunk underbust corsets comes in a broad range of styles that embrace the unique look of Neo-Victorian fashion. Our underbust corsets hug your middle under the bust, some of them fitting up around your back and shoulders or extending down over your hips with panels or skirts. Our steampunk corsets display fine materials, including silk, brocade, satin, leather, velvet, and cotton prints. The patterns vary from bold stripes to gears and schematics to antique maps to floral designs and beyond. Buckled straps, rivets, belts, chains, metal gears, buttons, and more decorate the corset designs, ensuring that each one displays a look that is uniquely its own. Many of our Neo-Victorian underbust corsets feature steel bones that give them excellent cinching ability, while some are specifically designed for waist training. Our womens corsets are available in a number of different sizes to help you find one that fits you comfortably. Take a moment to look through our fine array of underbust corsets to find the ideal style to go with your steampunk blouse or period dress! Whether you wear these steampunk corsets by themselves or over a steampunk dress or period blouse, you will be able to show off a stunning hourglass figure. We carry a wide selection of womens overbust corsets infused with the best elements of steampunk style. Made with brocade, velvet, leather, jute, satin, and other high quality materials, these steampunk overbust corsets offer incredible style while fitting snugly around your torso. 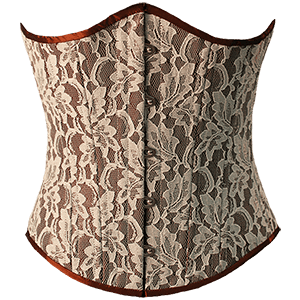 Many of the overbust corsets feature steel bones for strength and structure, and some are intended for waist training. Metal clasps, shoulder straps, chains, buckles, lace, embroidery, and steampunk prints ensure that there is an overbust corset to suit your steampunk outfit. Some of our sweetheart corsets include cover up jackets or attached belts, as well. Peruse our many Neo-Victorian overbust corsets to find the perfect piece to match your steampunk couture.